Some interesting articles following the announcement of the Sony VAIO UX, that you should read if you are interested in this. Now that the details of the new Sony UX Micro PC have been released two things are clear. First this device is NOT an Origami/ UMPC device since it doesnâ€™t meet the requirements of that device and it does not have the Tablet Edition nor the Microsoft Touch Pack installed…. The second thing that is clear to me is that the UX Micro PC (UXMPC?) is a total OQO killer. CNET.com -Can Sony Save the UMPC? 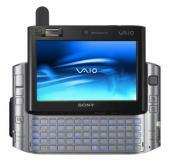 Throwing its hat into–or at least nearby–the UMPC ring, Sony has announced the VAIO UX180P Micro PC. Taking some of the most innovative elements of the T-Mobile Sidekick and the OQO Model 01……. Leaving price aside for the moment, the fact that it has a built-in keyboard is critical, and it gives the VAIO UX180P a better shot at success than other early UMPC designs, including Sony’s own VAIO U50. This entry was posted in Articles, Commentary, Sony, Tablets. Bookmark the permalink.